5714 ✉ 174K 1 Fr. 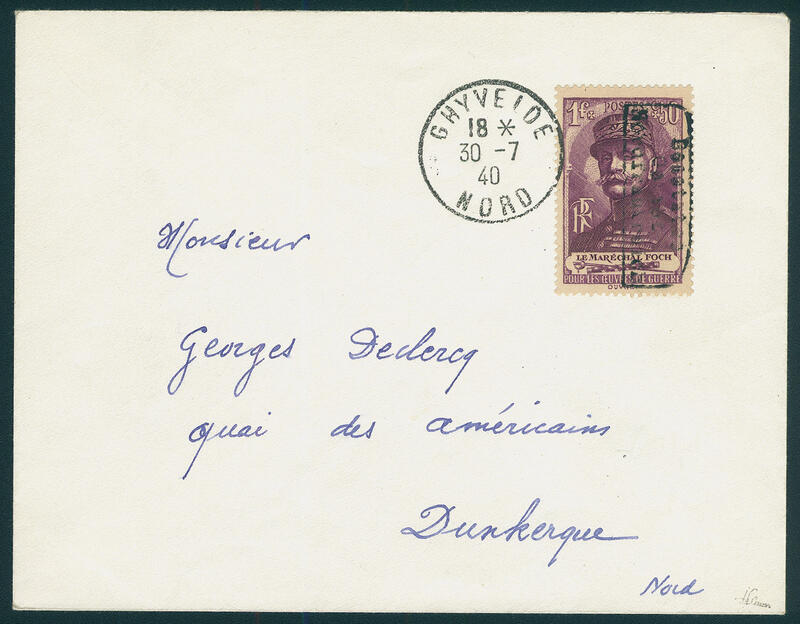 Marshal Foch, type I, with inverted overprint, as correctly franked single franking on cover from \"GHYVELDE 30.7.40\" to Dunkirk with arrival postmark. Very rare. Photo expertize \"the condition is perfect\" autumn VP. 5593 ⊙ 3 3 Kop. 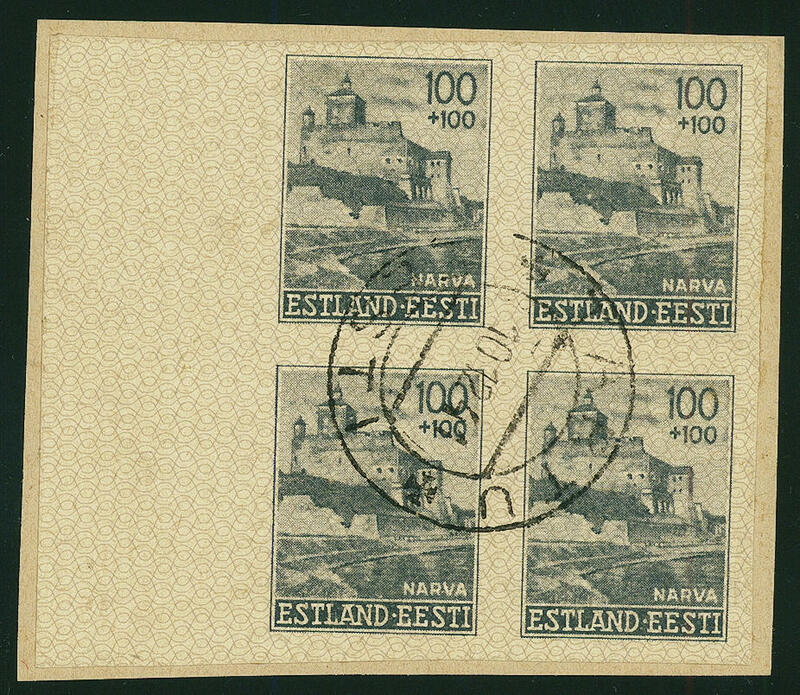 Pale blue, fresh colors, large margins all around from right margin of sheet with overprint \"EESTI post\", neat cancelled in perfect condition. A rarity of the German occupation issues with an edition from only 200 piece! By Michel catalogue clearly undervalued. Photo expertize \"the condition is perfect\" Krischke. 5594 3,3KF 3 Kop. 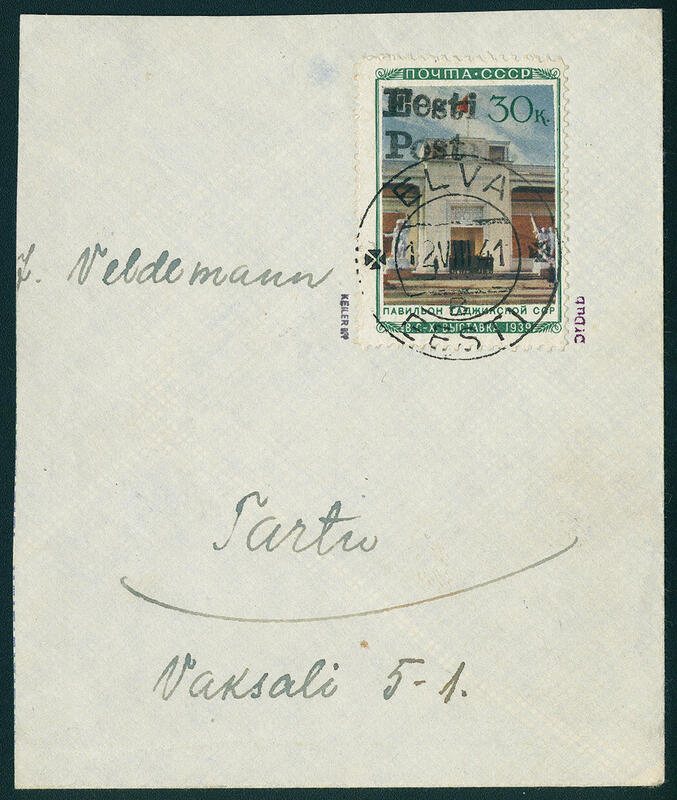 Dark greenish blue, cut, vertical pair with hand stamp \"EESTI post\", which by of the upper stamp inverted affixed was, fresh colors and in perfect condition mint never hinged without any signs. A very rare combination pair, from the especially in mint never hinged condition only a few copies became known are. By Michel clearly undervalued. Photo expertize \"genuine and immaculate\" Löbbering BPP. 5595 ⊙ 3KZ 3 K. Pale blue in the vertical pair, large margins all around with hand stamp overprint \"EESTI post\", above normal, at the bottom inverted, neat cancelled in perfect condition. There are very few this tête-bêche pairs have become known. These are among the great rarities of the German occupation issues! Photo expertize \"genuine and immaculate\" Löbbering BPP. 5596 ⊙ 10 50 Kop. 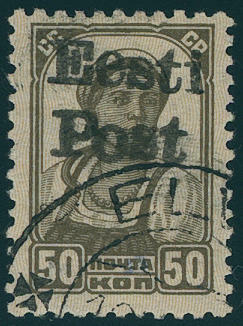 Brown with hand stamp overprint \"EESTI post\", fresh colors and neat cancelled \"ELVA\". 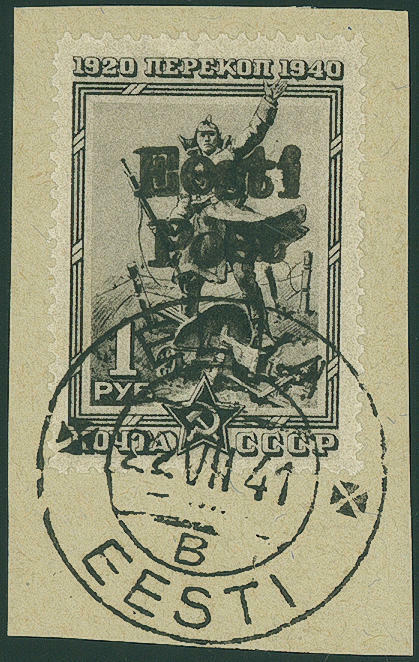 A very scarce issue with an edition from only 200 pieces. By Michel clearly undervalued! Photo expertize \"genuine and immaculate\" Prof. Dr. Klein BPP. 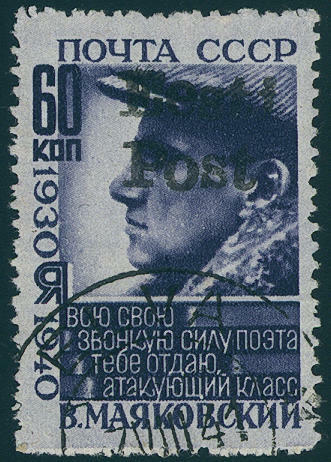 5597 10KF 50 Kop. 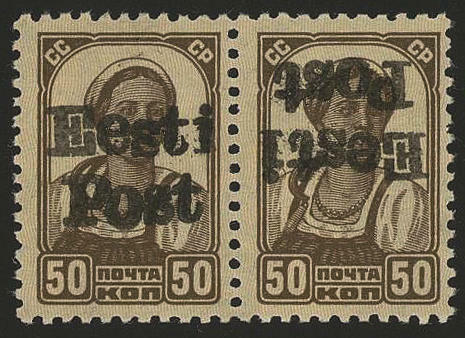 Brown, horizontal pair with overprint \"EESTI post\", the left stamp with normal overprint, the right with inverted overprint, fresh colors and very well perforated, in perfect condition mint never hinged the total print run of this stamp amounted to be anyway only on 200 pieces. This \"tête-bêche pair\" is an unique thus one of the most spectacular rarities of the German occupation issues. Photo expertize Krischke BPP, as well new photo expertize \"genuine and immaculate\" Löbbering BPP also therein as unique designates. 5598 ⊙ 11 60 Kop. 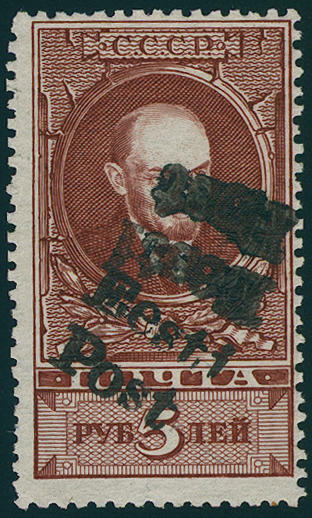 Carmine with overprint \"EESTI-POST\", fresh colors and neat cancelled in perfect condition, issued only 200 pieces and by Michel undervalued, photo expertize \"the condition is perfect\" Krischke. 5599 12 3 Rouble green with overprint \"EESTI post\", wonderful fresh colors and exceptional clean perforated, in perfect condition mint never hinged an outstanding quality this large rarity of the German occupation issues! 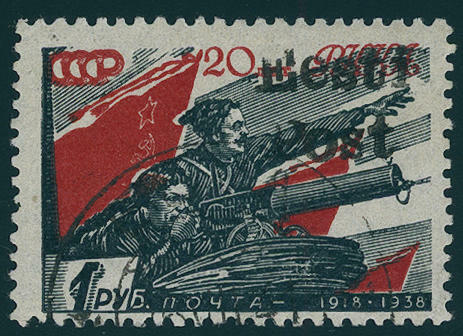 Issued only 70 piece, so that only a few perfectly mint never hinged examples have become known. By Michel fully undervalued. Photo expertize \"genuine and immaculate\" Löbbering BPP. 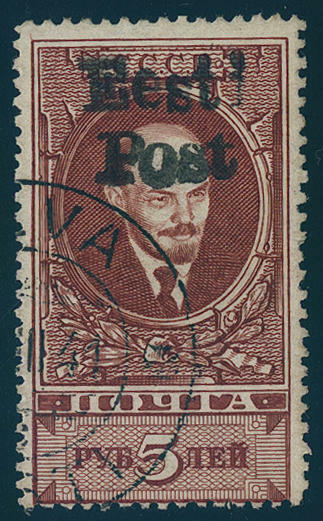 5600 ⊙ 13 5 Rouble reddish brown (Lenin 1939) with overprint \"EESTI post\", fresh colors and neat cancelled \"ELVA\". An extraordinarily scarce and undervalued issue. The edition amounted to be on only 70 piece! Photo expertize \"genuine and immaculate\" Prof. Dr. Klein BPP. 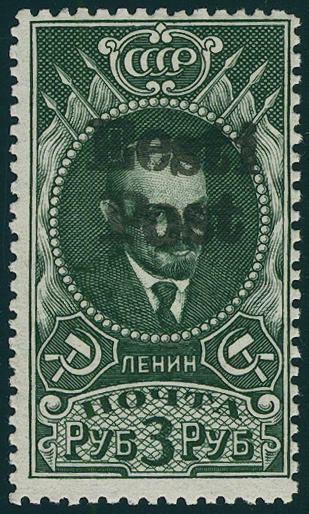 5601 13DDK 5 Rouble Lenin with double overprint \"EESTI post\", of it one inverted, fresh colors, without gum, as far as in perfect condition. A spectacular rarity of the German occupation issues. With a total issue from only 70 piece counts these variety to the largest valuables of this area. In this kind in the Michel special catalogue unlisted and probable unique! Photo expertize \"genuine and immaculate\" Löbbering BPP. 5602 ⊙ 17 60 Kop. 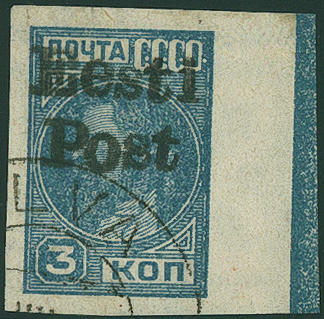 Black blue with overprint \"EESTI post\", fresh colors and in perfect condition, neat cancelled \"ELVA 7. VIII. 41. \". A nearly always missing issue with an edition from only 100 pieces. By Michel clearly undervalued! Photo expertize Krischke BPP. 5603 ⊙ 19 80 Kop. Carmine with overprint \"EESTI post\", fresh colors and very well perforated from upper margin, neat cancelled in perfect condition. Issued only 200 pieces and by Michel clearly undervalued! Photo expertize \"the condition is perfect\" Krischke BPP. 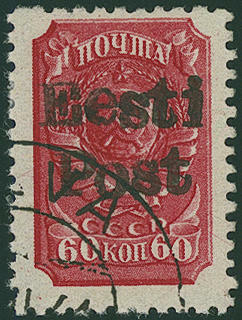 5604 ⊙ 20 1 R. Red / black with hand stamp \"EESTI post\", fresh colors and neat cancelled \"ELVA 16. VII. 41. \" in perfect condition. A very nice copy this extraordinarily rarely issue, whose edition be on only 200 pieces amounted to. By Michel catalogue clearly undervalued. Photo expertize \"the condition is perfect\" Krischke BPP. 5605 ⊙ 21 1 R. Periscope with overprint \"EESTI post\", fresh colors and in perfect condition on magnificent letter piece, perfect used \"ELVA 22. VII. 41. \". Of an of the most beautiful known examples this large occupation rarity with an edition from only 200 piece! By Michel catalogue clearly undervalued. Photo expertize \"the condition is perfect\" Krischke. 5606 ∆ 33 30 Kop. 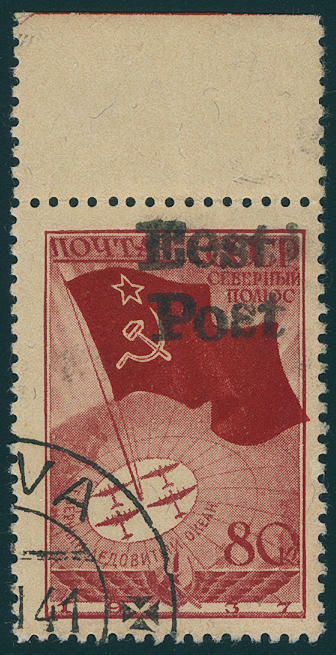 Agricultural exhibition Moscow 1940 with overprint \"EESTI post\", fresh colors and in perfect condition on very nice large letter piece, clear and turning into cancelled \"ELVA 12. VIII. 41. \". An outstanding quality this top rarity. There are only eight examples from this known, the to the largest rarities of the German occupation issues count! Expertized wild boar BPP, photo expertize \"the condition is perfect\" Krischke. 5592 ⊙ 4/9U Reconstruction 1941, faultless block of four set unperforated on beautiful letter pieces, neat cancelled, in this kind very rare, expertized Krischke BPP. Michel 1000,- €. 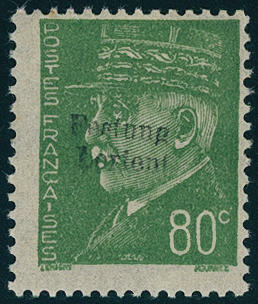 5718 6 70 C. Marshal Petain with overprint \"fortress LORIENT\", fresh colors and in perfect condition mint never hinged, issued only 300 pieces and by Michel clearly undervalued! Expertized Calves, photo expertize \"the condition is perfect\" autumn VP. 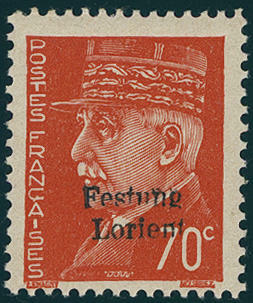 5719 7 80 C. Marshal Petain with overprint \"fortress LORIENT\", fresh colors and in perfect condition mint never hinged issued only 300 pieces and by Michel clearly undervalued! Expertized Calves, photo expertize \"the condition is perfect\" autumn VP. 5720 10 1, 50 Fr. 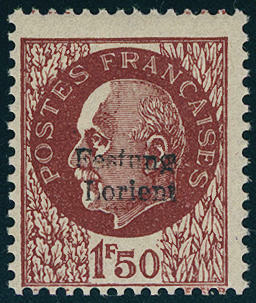 Marshal Petain with overprint \"fortress LORIENT\", fresh colors and in perfect condition mint never hinged issued only 1800 pieces and by Michel undervalued. Expertized Pickenpack BPP, Calves, photo expertize autumn VP. 5724 ✉ 9 50 Gr. 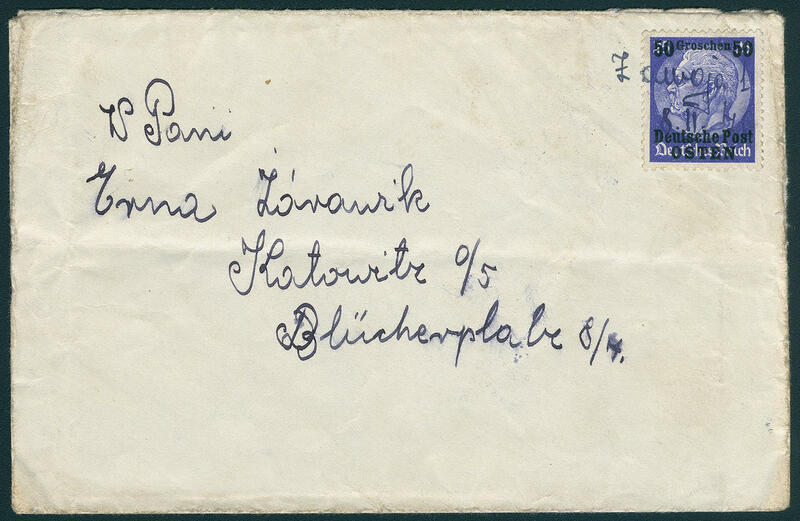 On 25 Pfg., commercially used on cover, slight traces, with rare handwritten cancellation \"ZAWOJA 8.11.40. \" to Katowice.